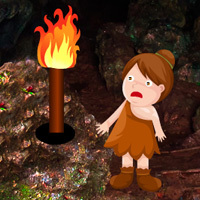 Wow Cave Girl Escape is another point & click escape game developed by WowEscape. In this game, you came to see the beauty of a cave deep inside a forest. But unfortunately, you noticed that a cave girl is trapped inside the cave. You have to find the way to help the cave girl by finding useful objects, hints and by solving puzzles. Click on the objects to interact with and solve puzzles. Good luck and have fun! Played earlier, not difficult. Thanks WOW. The only thing you'd have to think about is the 5x5 grid with numbers going across the top and down the left side. This is not math. Light up the number of squares needed for each column/row. I am missing one yellow flower and can't find fourth rock thing. Hi all. On the 5x5 grid, if you have 4 on top, you must have 4 lit squares in the column. 4 on the side is 4 lit squares on the line, same with 1, 2 and 3. It's a puzzle. Unfortunately, did not write down my solution. What I did is start with a + in the middle. Giving 3 out of 4 squares in the center column and line.